Click on a thumbnail for photo and description..
What kind of toys are you guys playing with? 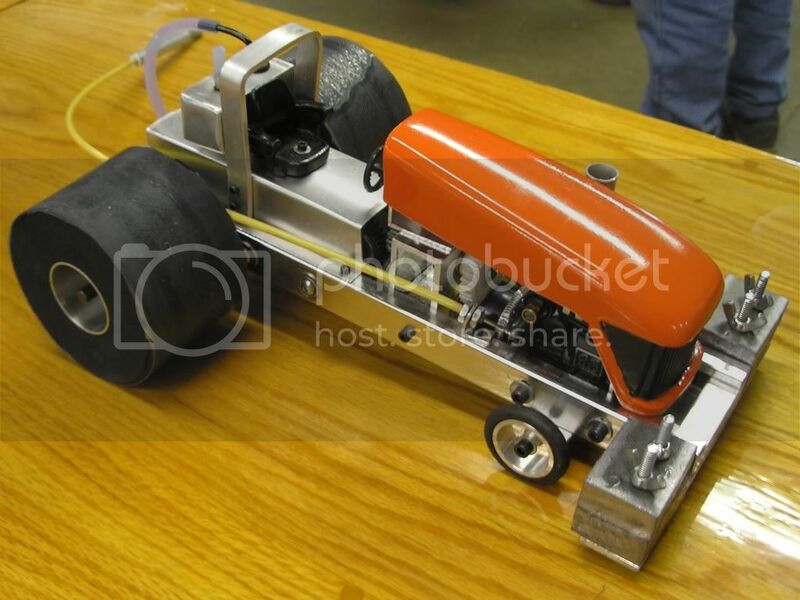 Micro-Mini Tractors and Trucks originate from ERTL type tractors or Tonka size trucks which are then fitted with a nitro burning model airplane or car engine, driveline, and special pulling tires to compete on a sealed hardwood or formica surface. The weight of the transfer sled ranges from 100 pounds or so for the 3 lb Pro Stock tractors up to 650+ pounds to stop some of the 6 lb Open pullers! Where can I see you pull? Each year approximately 60 NMMTPA sanctioned pulls are held in places like Illinois, Indiana, Iowa, Kansas, Maryland, Michigan, Minnesota, Missouri, Nebraska, Ohio, Ontario, Pennsylvania, Texas, and Wisconsin. Check the upcoming events list and attend a pull near you. Where can I get more information? Email the Bad Boys of micro mini pulling or post a question on our message board. You can research NMMTPA rules questions using our Searchable NMMTPA Rule Guide. Also be sure and visit the Official NMMTPA website.